The Hotel is located in the vicinity of the lighthouse (800m from the ferry to Venice), and Jesolo and Cavallino Marinas. It makes for an ideal starting point for trips to Venice and the Lagoon, the islands of Burano, Murano, Torcello (the bus top is just 30m away). Guests can make use of the bicycles at their disposal to enjoy a number of excursions or may decide to practice water sports, tennis, horse riding and golf. 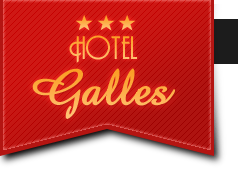 Welcome to Hotel Galles, we are preparing a new offer to be proposed for the summer season in Jesolo. Summer is synonymous with sun, sea, fun and the tourist town of Jesolo Lido offers even more. Throughout the summer events are organized sports and entertainment on a national and international level. As a steady stream of tourists every year from all over Europe fill the accommodation, giving Jesolo the title Queen of the Adriatic tourist.